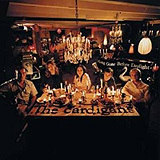 Long Gone Before Daylight is The Cardigans first studio album since their fourth LP Grand Turismo was released in 1998. Consisting of thirteen tracks (including two bonus tracks, 'Hold Me' (Mim Version) and 'If There Is A Chance') of catchy, simple, Scandinavian pop, recorded in a more back-to-basics style. Features guest appearances from The Hives Howlin' Pelle Almqvist, Ebbot Lundberg from the The Soundtrack Of Our Lives and Nick Royale from Hellacopters. This CD includes an enhanced feature DVD that allows access to exclusive Cardigans content. If you would like to win one of these brand new Long Gone Before Daylight CDs just answer this easy question: Which single back in 1996 was the song that broke the band on the airwaves here in America?